Tom Adams is an independent energy and environmental advisor. He says the high cost of electricity in Ontario is in large part due to renewables. 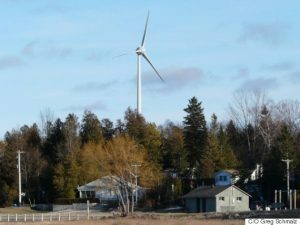 Is renewable energy responsible for driving up Ontario’s electricity costs? Read the article and comment here. Norway has plenty of cheap hydro power and it takes energy to produce biocoal. A plant would have to be built in Ontario to produce biocoal or converted from a pellet production plant to biocoal pellet production. The Green Energy Act is an example of policy making at the sub-national level. ‘Stranded assets’, ‘stranded debt’ is what intelligent investors are now calling this mess. With technological innovation occurring at accelerating rates these days, the thought of being stuck with this outrageous situation for 20 years is unthinkable. Now you know where I Sommer…. the turdbines for DD are the largest… tallest…. most powerfull turdbines available…. it will disrupt the environment for all… except the leaseholders… I’m terrified and am already starting to suffer from sleep loss…. might be a good defence for me later…. I am so disappointed and so angry at our provincial Liberals for ignoring common sense and basic %@$#÷%%# MATH….. If you burn your mouth while eating piping hot pizza… your brain SHOULD tell you next time …. HEY THAT’S HOT…. YOU’RE GONNA BURN THE ROOF OF YOUR MOUTH Ahhhhhhhhhhhhhhhhhhhhh!!!!!!!!! That’s hot!!!! The communities that the Liberal ideology has destroyed is despicable…. for dog sakes are we so stupid that we believe that using 4L. of desiel fuel to make 1 L. of green energy ethanol…. really!!!! to remove 4 coal fired generating stations that were 95% efficient…. seriously….. c’mon people… wake up!! Stop being so Canadian and start standing up for YOUR CANADA!!!! The one that use to NOT seize your rights to say “No Thanks” !!!! BOOM there it is again!!! Stripped of their RIGHTS!!!!! What are you gonna do about it!!!!???? I’m going to cut firewood cause natural gas is getting pretty darn pricey…. It’s hard to believe this is happening in Canada. National Geographic, Nov. 2015 issue. Barbara, have you seen this article from a German executive who is calling their industrial wind development a “huge botch”? Intelligent investors are now using the terms ‘stranded assets’ and stranded debt’ in reference to the 20 year contracts. I pity the people who are working in the relevant ministries in Ontario right now trying to find a way forward in this mess. This is a serious ethical crisis. So many lives have been negatively impacted. The courts will have to sort this out if this government doesn’t. Philipee Couillard, Premier of Quebec. Organizations such as The Climate Group (founded 2004) work at the sub-national level. Re: The late Dr. Hremann Scheer, 2008. Weekly Science Matters Column by Suzuki and Moola. Re: World Wind Energy Conference in Kingston ON last week. Re: Marion Fraser, policy adviser to Dwight Duncan from 2003 to early 2008. “We had low-income advocates, we had Greenpeace, we had First Nations, farmers, CEOs of energy management firms.” she said. Some one keeps taking used rubber tires from the local tire bin…. wonder what for??? Just starting to see pictures of the local damage to solar panels…. wow… I can see our insurance rates going up soon to pay for that!!! WRI/World Resources Institute, Washington, D.C.
Wind gusts up to 115 km were reported at the Lake Simcoe Regional Airport at about 3:30 pm. Re: Renewable integration at Cal ISO. Article includes cloud movement forecasts but thunderstorms happen rapidly and new models are needed to address this problem. Interview with Mark Rothleder, Cal ISO. Re: A FERC conference, Washington, D.C.
FERC Conference, June 1, 2016, Washington, D.C.
Related PDF files, right sidebar for presentations at this conference. Miranda Keating Erickson, Vice-President, Operations, Alberta Electric System Operator. Alberta AESO appears to know that there are grid security issues. Read the presentation at the above FERC website. Sponsored by the Ontario Government. Note the speakers and the ENGOs they represented. By invitation only as far as is known. Not the same as the July ‘Forum of the Americas’ 2015 also in Toronto. RE: Increased health care costs & grid instability. Article includes a quote by Dr. Kapil Khatter. Also: Halifax Examiner, Aug 27, 2015, available online. Resolutions Adopted (Confirmed), CMA, Aug.24-26, 2015 – Halifax, NS. “The Canadian Medical Association will promote the health benefits of a strong, predictable price on carbon emissions. (DM 5-21). Re: Fossil fuels, Divestment & Reinvestment. Article has links to more information. Dr. Lynn Marshall, member of the Environmental Health Committee of the OCFP. Reference from the March 21, 2017 Globe And Mail article: Canadian Public Health Association. Canadian Public Health Association, Discussion paper, May 2015, 28 + pages. Lead Author, Dr. Trevor Howard, Co-Founder of CAPE. Correction to the above CPHA: Is Dr. Trevor Hancock. Use the “report” link instead in the article > CPHA paper. Or internet title search: “mandala of health”, 1985. Research Gate has this paper under ‘The Mandala of Health: A Model of the Human Ecosystem’ and use Google title search. Dr. Trevor Hancock prepared the background paper on which this report is based. Trevor Hancock is listed as a Founding Member. Is there anyone who can out-lie a trained Liberal? You know, Liberal, Entitled, and Scammers can all be interchanged in any sentence!